"Hip" means to know, it's a form of intelligence. To be hip means to be updated and relevant. You don't just observe a hop, you hop up and do it. We believe that the Arts are for everyone. The Arts open doorways to learning, growth, and discovery in ways no other teaching tool can. 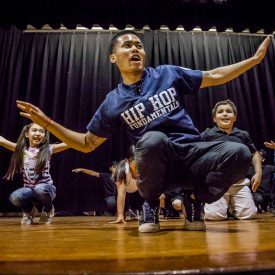 Our voice and our methods are rooted in the empowering artform of Hip Hop dance, which has the power to speak to youth in a very unique way. Hip Hop is communal, inclusive, individualized, direct, and above all, fun. We truly believe that we can teach any academic or social content through the lens of Hip Hop dance, and we strive to inspire and empower as many youth as we can to take charge of their own education and create their own aesthetic within our arts experiences. We aim to provide lifelong memories of joy, success, challenge, and self-actualization in all of our performances, residencies, and workshops. 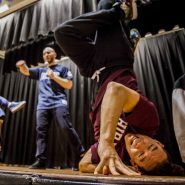 Hip Hop Fundamentals is an award-winning team of diverse professional breakdancers dedicated to Hip Hop Education. They are the world’s only breakdance education company combining academic and social content with the world’s most dynamic dance form. As certified teaching artists, seasoned performers, and battle-tested dancers, they are passionately driven to inspire audiences and participants of all ages. Hip Hop Fundamentals firmly believes that youth learn best when they are having fun. Their adynamic and interactive performances and workshops are guaranteed to empower, engage, and educate youth of all ages. 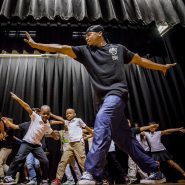 Hip Hop Fundamentals specializes in integrating academic content with arts education. 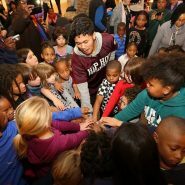 Since 2004, the company has presented hundreds of shows and workshops across the United States and worked with schools, community sites, cultural/social organizations, museums, educational conferences, and government agencies to bring their unique method of breaking education to youth. 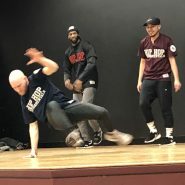 The guys from Hip Hop Fundamentals have a unique spirit and energy that is able to engage people of all ages and backgrounds. We've had Hip Hop Fundamentals at our school in the past. They are excellent and we are going to think about getting funding for them to come and do some kind of residency/workshop program. They provide the perfect balance of instructional material, participation, authentic expertise, and fun. It was tremendous, enjoyed by all. There is nothing that could have made it better. Bravo!!!!! !